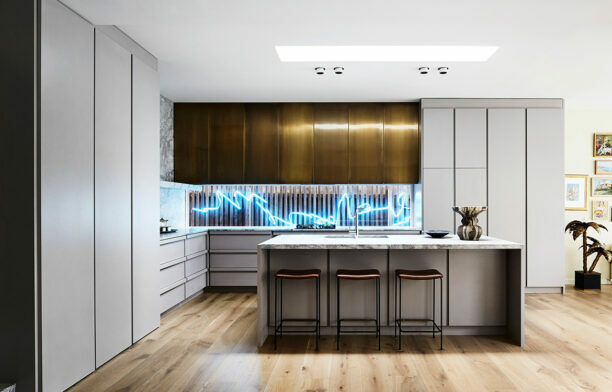 A Mosman Renovation By Daniel .. 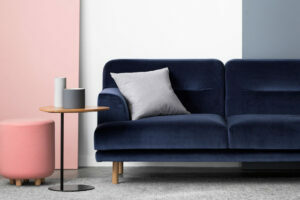 Celebrating Tableau – a tailor..
Australian architects and designers have mastered the art of bringing the outside in. Our climate calls for it and to ignore this would make for an ill-informed design completely out of touch with its context. The best responses have a degree of nuance to them, where light and ventilation can be regulated through controlling the boundaries of a home’s living areas so the occupants are always comfortable, no matter the season. In the bathroom, the same applies, albeit on a much smaller scale and with a heightened attention to privacy. While there may have been a time where bathrooms were made to resemble life sized terrariums, these days the approach is subtler. 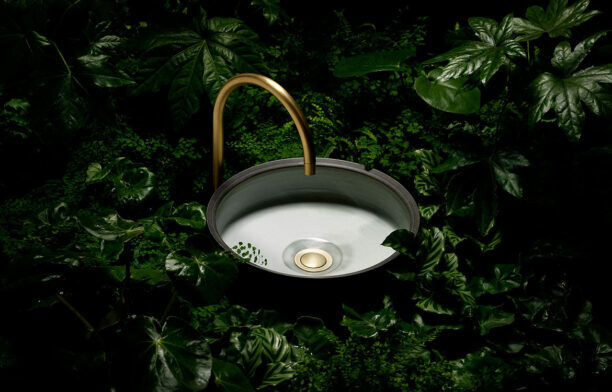 Architects and designers are creating bathroom spaces of sanctuary and calm and while they understand the role nature can play in realising this outcome, it’s not about giving clients a jungle retreat (unless they ask for it, of course). 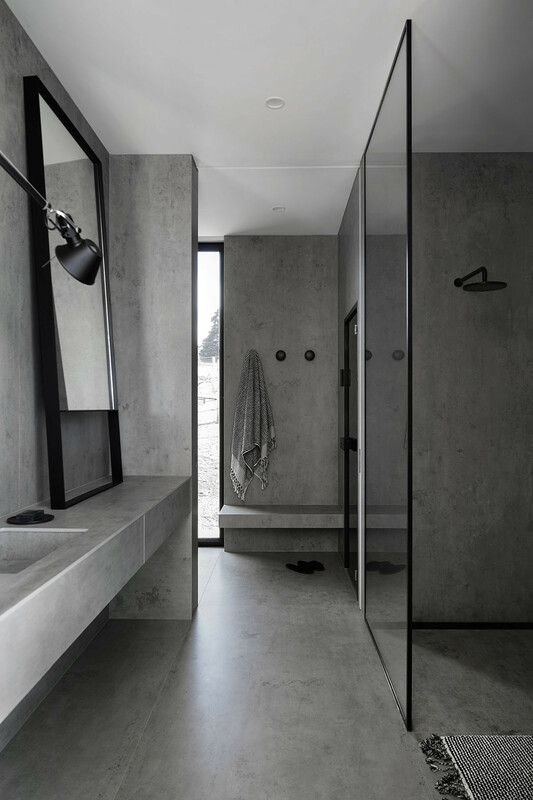 The following bathroom design blurs the line between inside and outside in ways that are understated yet effective. Christopher Elliott’s Eaglemont House is situated within the garden suburb of Eaglemont, once home to artists of Australia’s famed Heidelberg School of Art. The area may be much more heavily developed than when Arthur Streeton and Tom Roberts were painting landscapes en plein air, but it’s no less pretty. 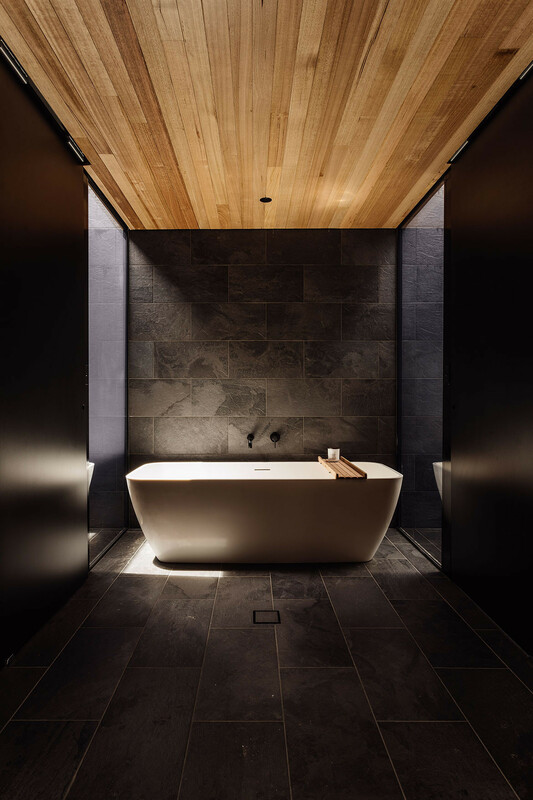 Elliott certainly looked to the natural surrounds when designing the four storey home’s interior architecture and this is especially evident in the upper level bathroom. Its bathroom design is daringly pared-back, with light grey marble tiles wrapping the floors and walls in one cohesive expression. 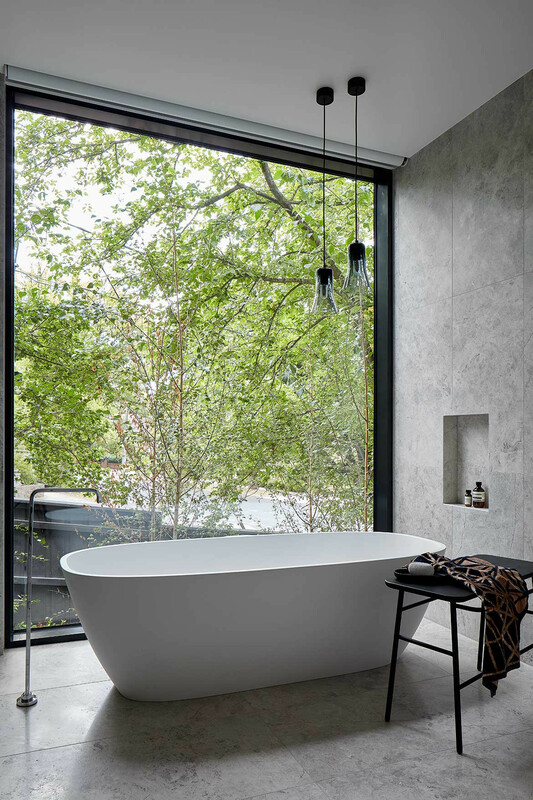 This palette provides a neutral background for the unadorned freestanding bathtub, which takes pride of place in front of a full-height window. The opening lets in the greenery and natural light and almost reads as wallpaper, such is the seamless visual connection between inside and out. Christopher addresses issues of privacy with a retractable blind, while the trees’ foliage acts as a screen. It’s incredibly neat design that makes the space feel all the more user-friendly. This freestanding accommodation pavilion located on the edge of a vegetated area within the Pumphouse Point site in Tasmania is a stunning sanctuary that’s as cosy as it is high-end. The architects have lined the interior walls and ceiling with timber boards, creating an immersive environment that most guests will never want to leave. 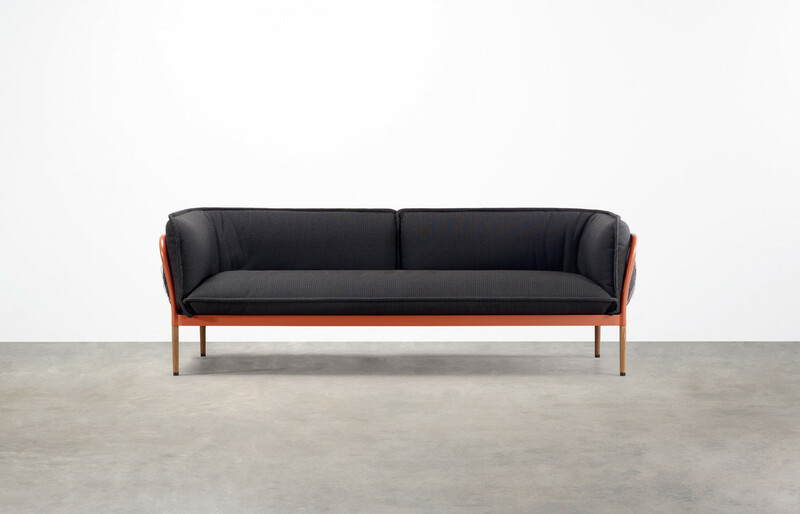 Elsewhere in the interior, robust dark materials punctuate the scheme, adding to the design’s experiential nature. 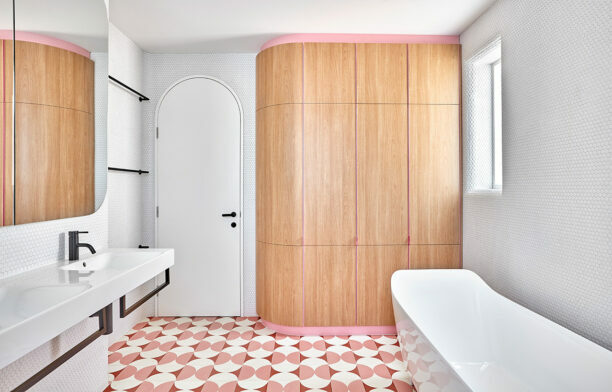 The same material palette is used in the bathroom, where two light wells have been carved out of the space’s corners. 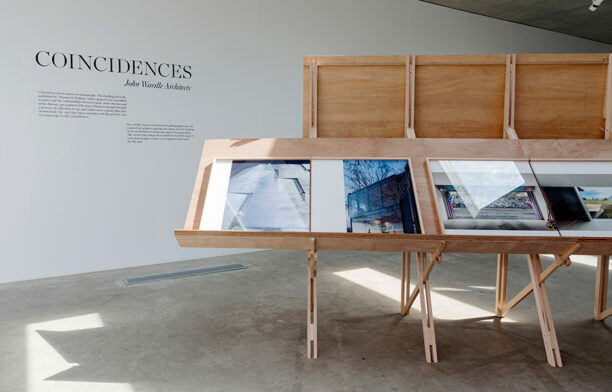 They offer connection to the earth and sky and serve to instil a strong sense of place yet are discrete enough that the interior’s enveloping quality is not lost.